One of our workforce solution offerings is a Managed Marketing Service. 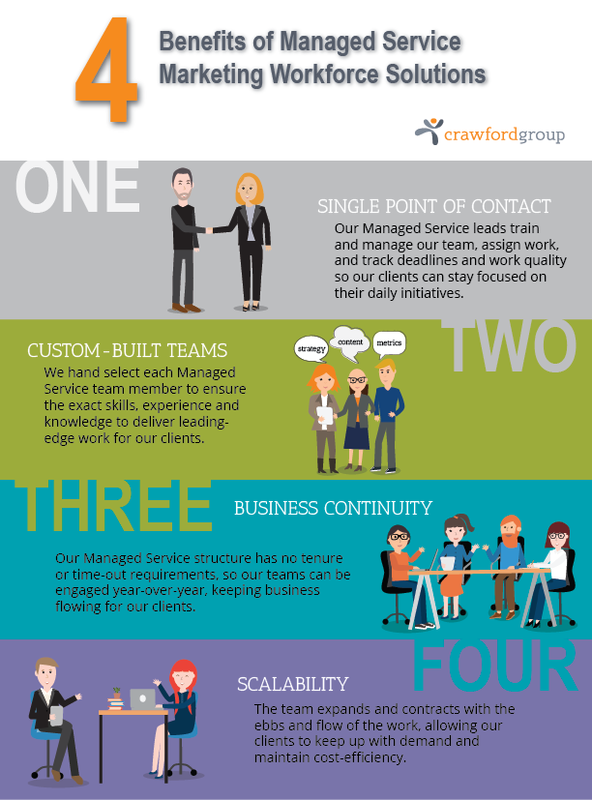 But what is a managed marketing service and why would your company choose to go this route when working with Crawford Group? The Infographic below highlights four key benefits. Single Point of Contact - Our service leads train and manages the team, assigns work, track deadlines, and work quality so our clients can stay focused on their daily initiatives. Custom Built Teams – We hand select each managed service team member to ensure the exact skills, experience and knowledge to deliver leading-edge work for our clients. Business Continuity – Our managed marketing service structure has no tenure or time-out requirements, so our team can be engaged year-over-year, keeping business flowing for our clients. Scalability – The team expands and contracts with the ebbs and flow of work, allowing our clients to keep up with demand and maintain cost-efficiency. These four benefits is just the start of the many advantages of a managed marketing services. Visit our website to learn more or send us a quick message to discuss the possibilities.